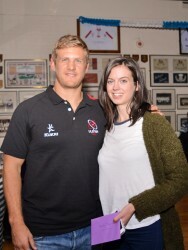 URSC held its second “Meet the Players” night on Tuesday 3rd November with Darren Cave, Chris Henry, Stuart Olding and Andrew Trimble on the panel and Jonathan Bill ensured they behaved themselves. Approximately 150 turned out for an evening that was ostensibly billed as a “Post RWC and Pre-European” night, but as ever the topics discussed ranged far beyond those and a great night was had by all. Before we got into the questioning, URSC made a special presentation to David Halleren, David has stepped down from the committee after a number of years very hard work, including a spell as treasurer, during which he kept the books in a superb and accurate manner. We couldn’t let that pass without acknowledgement, and so we commissioned a “Stan D’Upp” cartoon (thanks “Stan”) of Dave wearing his favourite All Blacks gear, and this was presented by Darren after all the panellists had autographed it. As for the questioning? All those present heard comparisons (criticism?) of some refereeing standards in the northern& southern hemispheres from the panel and the floor, but praise from the panel for everyone’s favourite Welshman, Nigel Owens. Under fire referee Craig Joubert was defended by one panellist, (who described him as best in the world). One of our foursome also turned out to be a Japanese supporter, and all of them were fulsome in their praise of our own “freak” who had announced himself on the world stage (Iain Henderson, if you hadn’t worked it out). 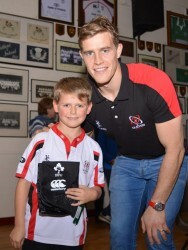 All the players are looking forward to the return of our “world class” skipper, scrum half and (the already returned) out-half (yes, they regard Paddy Jackson that highly) to the Ulster team, not to mention our other returnees (including Chris and Darren who have also already seen action since the World Cup). Darren & Trimby both defended Joe’s selections before and during the world cup, – whilst obviously being disappointed not to have played much, or at all, but they could understand his reasoning and found it hard to criticise. Everyone agreed the loss of Big Paulie was massive, but going forward there will be others to fill the void – not least our own “freak”. Questions and answers ranged much further than those above but if you want to know more, or exactly who said what, well, you should have been there. Our next meet the players event will be in the new year in time for the start of the 6N, so watch out for details nearer the time and plan on being there. Of course no URSC event would be complete without the usual ballot with prizes for all tastes including the now familiar “pocket money” prizes for the junior members, and the winners were delighted to receive the goodies from their Ulster heroes. 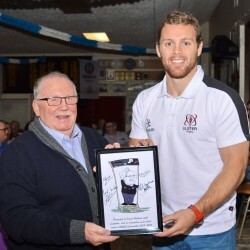 Special thanks are due not only to the players for giving of their time, and Jonathan for his usual masterclass in the compère role, but also to Molly Brown’s Kitchen and Bar for again putting up one of our ballot prizes, and especially to Malone RFC for use of their premises and hosting us so well.